Abby the Librarian: "The President Has Been Shot!" "The President Has Been Shot! 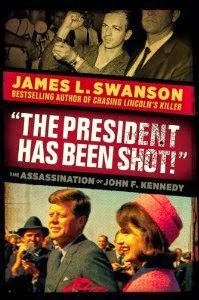 ": The Assassination of John F. Kennedy by James L. Swanson. Grades 7 and up. Scholastic, September 2013. 270 pages. Review copy received from publisher. "On the morning of Thursday, November 21, John and Jackie Kennedy said good-bye to their daughter, Caroline, and flew in the presidential helicopter, Marine One, from the White House lawn to Andrews Air Force Base in Maryland. Their son, John, who was almost three years old, loved flying in the helicopter, so as a special treat they took him along for the ride to Andrews. The boy wanted to fly with his parents to Texas as well. The president told his son that he could not come and that he would see him in a few days. The Kennedys took off from Andrews at 11:05am, flying to Texas on Air Force One, a sleep new jet that had become a symbol of the modern presidency. "John Kennedy had been president of the United States for two years, ten months, and two days. He had left some unfinished paperwork behind on his desk in the Oval Office, including an autographed photograph of himself intended as a gift for a supporter. After inscribing the photo, he had neglected to sign it. It was of no consequence. He could sign his name once he returned from Texas." As we know, JFK never did return from Texas because he was shot and killed in Dallas on November 22, 1963. This book puts you right in the middle of the action, giving the reader a bird's-eye view of all that transpired on that fateful day that changed history forever. My thoughts: Holy cats, I loved this book. I have really been waiting for some nonfiction to wow me this year and this is it, folks. Swanson gives you just enough background about JFK's presidency and Lee Oswald's traumatic life before plunging into a compelling play-by-play of Kennedy's assassination and its aftermath. I hid out, eating lunch in my office so that I could read undisturbed, which turned out to be an excellent idea since I found myself getting unexpectedly emotional as I read. Jackie Kennedy's strength as she stood by her husband through the entire ordeal, moved me to tears more than once. This is just the book for teens interested in American history or anyone looking for gripping nonfiction. Swanson has a book for adults coming out next month (End of Days: The Assassination of John F. Kennedy), which I have to believe makes this teen book an adaptation, but it's very well done. I haven't read the adult title, but I felt like I got a complete picture in The President Has Been Shot. Back matter is extensive and includes source notes, a bibliography, an index, suggestions of places to visit, diagrams showing the trajectory of the bullets and Oswald's path through the Book Depository fleeing the scene, and more. Throughout the book, archival photos are used to great effect, an important inclusion since the new media of TV and color photography were important players in JFK's brief presidency. Readers who enjoyed the fast-paced history story might enjoy Swanson's other books for young readers: Chasing Lincoln's Killer and Bloody Times (both adapted from adult nonfiction books). I would also suggest Steve Sheinkin's teen nonfiction titles Bomb and Lincoln's Grave Robbers. Readers fascinated by the Kennedy assassination who don't mind a fictionalized account may also enjoy Stephen King's 11/22/63 about a man who finds a wormhole that takes him back to 1958 and his mission to prevent Kennedy from being shot. Hey, happy Nonfiction Monday! You can find this week's roundup at Perogies & Gyoza, so make sure to stop by and check out what nonfiction is being read across the blogosphere this week.